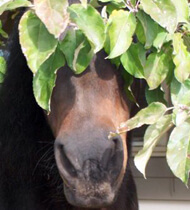 A Cure for Equine Canker – It Works, Read on! This is the post that started the Horse and Man blog in February of 2010… A very important post so I’d like to repost it today. If you are frantic like I was, hoping to find a workable treatment for equine canker — let me impart to you my year of Canker-Horrors and the final cure! 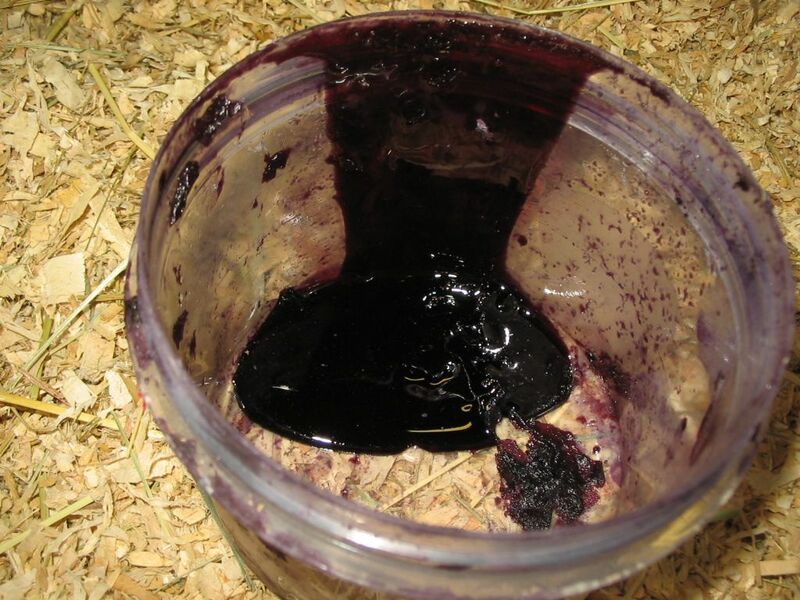 First off, to save you from reading the entire post if you don’t want to, here is the information for the remedy from Well-Horse which they call “Purple Mush”. You have to call or email since the Purple Mush is not available on the website. This salve, made from plant resin, is a Miracle. Hallelujah! It works almost immediately, is easy to apply and affordable. I did everything known for equine canker. I consulted many specialists. I spent, literally, thousands of dollars and thousands of hours on this. 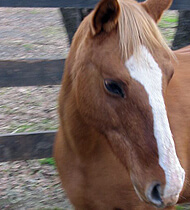 Some products and treatments worked on my mare’s mild areas but nothing worked for her profound front hoof infection. 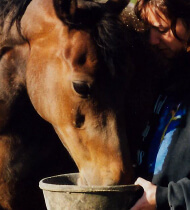 My mare was pampered, not in a wet paddock with bacteria in mud – as some vets will lead you to believe. It started near the end of her last pregnancy. Canker appeared in three of her hooves. I didn’t know it was canker. I thought it was thrush. But, it didn’t go away. After consulting several vets and specialist, the reality is that no one knows what causes canker. It is widely thought of as an external infection but it could be systemic. (I will say why this might be true for my mare later.) And, it isn’t breed specific either although it happens more frequently in Drafts. I’ll try to state is simply here. 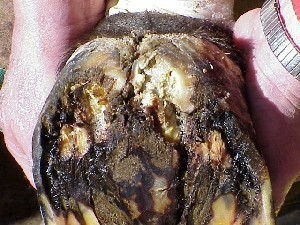 Canker is an infection of the equine frog, sole, bars, hoof wall and/or heel. It first presents like thrush but upon investigation, you will see that it is more like a mushroom overgrowth that looks somewhat similar to cottage cheese and smells really bad. Here is a picture of an advanced case — very much how my mare’s foot looked after we could not get the canker (we thought it was thrush…) under control. A bad case of canker… different than thrush although most people think canker is a bad case of thrush. Well canker is fairly rare, especially in Morgans. So, I had never seen it and my farrier had never seen it. We kept thinking that her fetid smelling hooves were a bad case of thrush. Lo and behold, our next farrier appointment came around and my farrier said he had done some research and now thought that this bad case of thrush was actually ‘canker’. ??? We called my vet and sent him a photo via our cell phone. The vet said that it sure looked like canker but it would have to be biopsied. 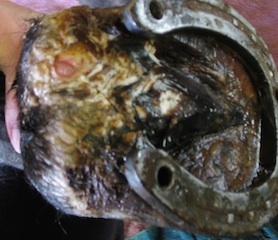 Between the time of the farrier visit and the initial biopsy, Tess developed this nasty condition in two other hooves. The front right was far worse and started to eat away her frog and heel. We tried the best known treatment designed by the specialists in equine podiatry which is described in the linked article above. Basically here is what you are supposed to do: have your vet or a surgeon abrade the area (usually the horse is under sedation) to remove all the infected tissue. Then you treat the hoof once or twice daily by first wiping the area with a compounded mixture of acetone and benzoyl peroxide, then apply crushed up metronidazole tablets, pack that with cotton gauze and then secure the hospital plate (that your farrier has fitted), vet wrap the foot and then affix a duct tape or some other waterproof boot — all with the hoof in the air. Ugh. Twice a day. Double ugh. You are miserable, the horse is miserable and it is really a pain to do this. To be honest, this method did halt the minor cases of canker in her hind feet. Unfortunately, the severe canker up front, was resistant. It would not abate, no matter what we did. 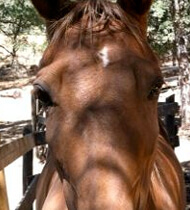 After 10 months of the above therapy, new treatments http://www.ericnystrom.com/aep.html, several debridements, constant wrapping, many vet calls and one deep debridement surgery at Loomis Basin Equine Hospital, the canker continued to grow back. Without another option, the foot specialist was considering removing her frog. I was beside myself with fatigue and worry. Tess’ hoof after 10 months of trying all the recommended treatments by specialists. 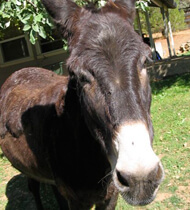 A Miracle… Out of the blue, a friend of mine told me that she had heard of a master farrier from Santa Ynez that had a canker cure. Really? I had nothing to lose… So I contacted CoCo Fernandez. He was quite personable. He put me at ease and said that he had much success but wasn’t quite ready to put the product on the market. I begged him to send a sample. He said if I was willing to test it for him and be a case study, then he would send it. I jumped at the chance. He called it the “Purple Mush”. I applied the Purple Mush (a textured goo pictured below) to her very clean and dry hoof, added some cotton padding and then wrapped it — very easy. I waited pensively for three days. I knew how much damage the canker could do in three days if left to its piranha ways. When I unwrapped the hoof, I noticed the canker had not grown and was actually dry. I was amazed. I heard violins! I couldn’t believe it. Something was actually halting the growth of this insidious, nasty packman-like bacteria! I held my breath and re-applied the mush. Three days later, I swear, the canker was gone. Absolutely GONE. I kept applying the Mush for two weeks as I watched healthy foot grow. I could not believe it! I called everyone I knew and then asked for a meeting with my vet. My vet thought he was coming out to discuss my mare’s upcoming, last ditch effort, canker surgery. I asked him to look at her foot once again before we made the decision. I stood back as he lifted her foot. ..
OMG! He repeated his disbelief about 100 times in succession. OMG!OMG!OMG!OMG! He could not believe what he was seeing either. After almost a year of struggle, the beast was gone after just two weeks of Purple Mush Magic! The last of the miracle mush pictured here! Now my vet carries Purple Mush on his truck. I promise you. Use it. Your days will become yours again and the nightmare of pastes, wraps and horrible infection will be gone. Gone. Please let me know if you try this and it works for you, too. Also, please ask any questions! I can tell you how to apply it for success! Tess is happy, healthy and retired into motherhood thanks to Well-Horse Purple Mush! Please learn about our Bucket Fund and Alaqua Animal Refuge! 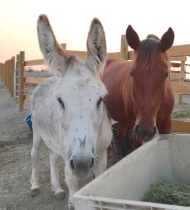 Friday thisnthat… Mama Tess update, Blind Filly update and a website for Equine disease outbreak alerts! MAMA TESS UPDATE: There is blood in her toes! Yes! I’m really sorry that it didn’t work for you. Over the years, I have noted that a certain type of canker is not abated by Purple Mush. If you’d like to speak to me personally about my 2 buts with incurable canker, I’m here and happy to help. My mare suffered for 1.5 years and 2 surgeries. wrapped for 3 days? I wish I could help her…as I know you do, too. The Purple moosh did not work for my WB mare. I applied it exactly as instructed. It seems to help a little but, not a cure. I think it would work well for thrush. I had her hoof surgically cleaned and froze, then applied the purple moosh and is didn’t seem to get better or worse. I have spent 4 months working with vets to get her better and am not hopful =(. Either the application is not quite right… or your Mammoth has the kind of canker that cannot be cured with the Purple Mush. need a suggestion on application. –Just hoof pick out the area, don’t wet it. Pic it clean and brush as much debris out of there as possible. all the crevices as best you can. Don’t worry if it is hard the first time. Just do what you can and wrap the foot . you can buy one. then keep him out of a muddy environment. In three days, check it and re apply. Keep the horse out of a wet environment. I am trying the treatment now…and not getting anywhere. I don’t know what I am doing wrong! I’m exhausting myself trying to follow all the instructions but it is very hard to get my horse to stand still for hours to get her feet dry and the purple mush just seems to be keeping her feet moist and mushy. I’ve seen no regrow th of new hoof tissue. I’m getting discouraged and don’t know what to do. Where can you buy Purple Mush at in Canada? that it didn’t work for perhaps applied it incorrectly? I don’t know. I will say that i feel it is stress related. Ask me how to apply if you are confused at all. Also, since you are in the area, call my horse vet (now a small animal vet) who was amazed at the results. Mario Dinucci. Mother Lode Vet. Grass Valley. Hello, I just found out my Gypsy Vanners canker has returned. 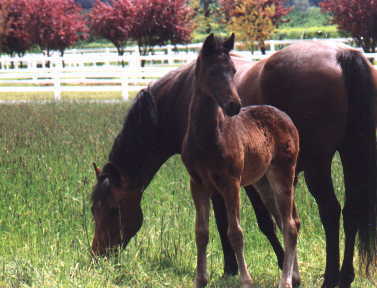 We too went through the typical treatment and several surgeries at Loomis basin equine. I’m going to order the mush now to try! Fingers crossed. I tried Purple Mush on my quarter horse. I had tried Epsom salts, antibiotic cream, a 50% solution of Clorox and water. Had the vet out and she washed it out with betadyne and coated it with antibiotic cream and wrapped it. No change. I ordered Purple Mush after researching canker. I was skeptical, but we applied it as directed and the canker completely disappeared after 5 days. I’m hoping it doesn’t recur. it drying up in a week, and gone in 2 weeks, then you know. But, it is totally worth it because it CURED my mare’s canker. I only had to reapply it once and she lived for 7 more years. Hi – I have been struggling with Canker for 7 months in my 15 yr wb/tb jumper in 1x front hoof, we treated with surgical debribement, cisplastin, Magot debribement therapy, scratches ointment, the frog has completely shed down to the digital cushion & deep flexor tendon. We think we got rid of the canker completely, frog is growing back very well but slowly as I live in Canada and the cold weather hasn’t helped. Now I potentially have canker in her hind leg and treating with Kevin Bacon Canker Care – anyone heard of it? It’s in the very early stages, where the heels bulbs are very soft and white cheesy, it looks just like thrush but because of my experience I am worried the canker has now moved into another hoof. Just wondering about switching to Purple Mush? Thank you! What would you like to know that wasn’t mentioned in the post? How do I speak with the post author about your canker experience? Paul: This is how I applied it which is a bit different than what the manufacturers suggest. Do what feels right for you. 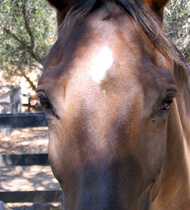 I KNOW it will work if your horse has the most common type of canker, which mine did. It was totally gone within 2 weeks. OK, I will cut and paste how I used it. –a boot or duct tape or some type of hoof covering. An Equine Slipper works really well! I use them exclusively now, instead of Duct Tape boots. You can get them at Valley Vet. OK, clean the area with something gentle. soapy water, maybe some antibacterial soapy water. Scrub the area as best you can to expose all the bad stuff. Dry the area very well. her foot without getting it dirty again. make sure to be able to stuff the mush down into the cracks. VERY IMPORTANT. is making sure the purple mush stays in the crevices and doesn’t just run all out. The cotton keeps it up there. Vet wrap the hoof to keep the cotton in there. Put on some sort of boot like aN Equine Slipper or Davis Boot or a Duct tape boot. Whatever you have … Just to keep it all clean. MAKE SURE it stays on – Whatever you use. Keep it like this for 3 days. Repeat every three days for two weeks. If the horse is in a clean stall, the vet wrap with duct tape is fine. If the horse goes outside, it has to be a DRY area and apply the boot. Keep me posted. It is AMAZING how it works. Just gave my Clydesdale her first treatment with PM. I hope this works. mare is alive and well over 4 years later! Hi! I was wondering if you could tell me what’s in Purple Mush? Great! I love these stories! My Tennessee walker developed a canker attached to the inside of his frog after he cut it on a rock, we thought the frog was growing back but when the vet looked at it we discovered it was a canker the size of a golf ball. My vet immediately told me about purple mush and I ordered it fron Coco. As soon as it came, my vet cut the canker out and every 3 days I packed the mush and wrapped his foot. Amazing stuff! His feet have never looked better! where can I purchase “Purple Mash”? 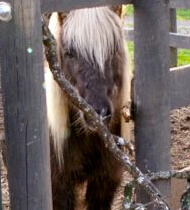 I’m a old farrier of 64 years old and I feel 55, nevertheless, Coco I do a lot of free work seeking what I call the backyard horse. Horses that are neglected and lonely. I found this draft with two bad feet and its frog rot or canker. I’ve made this my project to help this young girl to save her horse. I myself is having problems getting rid of this stubborn bacteria. 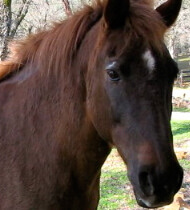 I really need your help in curing this horse. Can you help! Please Advise by e-mail or my cell number is 520-223-0033. Thank-You, for Your Time and Have a Great Day!! I am so happy a friend recommended this product and from reading you posts I am eagerly waiting its arrival. I live in Australia and have ordered it as my old boy has it in four feet. I am trying to fix one foot first to see how it goes and my vet hadnt heard about this product. I am going out every day now andcleaning out the hoof and applying the well horse resin and then a mixture my vet made up which is Engemycin and Sulprim into a paste and apply and then wrap it up but I dont know that its going to work from what I have been reading and I dont want him to get worse so I really hope the purple mush turns up soon!! Any advice on how to apply and what I am in for with the pruple mush would be greatly apprciated. God I hope it works!! We appreciate all the feedback on Purple Mush for the treatment of canker. Yes, we have shipped to the UK, and many other countries. 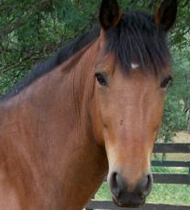 You can now order on line from our website: http://www.well-horse.com You can also email me at tdemma@well-horse.com. Hi, just wondered if you’d had any luck with getting the purple mush in the UK? What is the companys name? I may be interested in buying some but seem to chase my tail on contact info. I have a 26 year old qrtr horse who has had canker since last fall. He has been debried once and it came back…all four hooves. We live in Nw Ohio. The horse is getting tired of this stuff and so are we…last ditch effert. Please someone advise. Thank you. We rescued our Belgian from a kill pen in PA…shortly after, we discovered he had terrible canker, in addition to a double bone infection (both rear feet), abscesses, and more. I could go on and on. We had the farrier and vet coming to our barn every 3-4 weeks sedating and debriding Caesar’s feet…after over 16 months of packing, multiple debridements, a year on bute on and off, limited turnout and cleaning his stall up to 5 times a day to keep him clean, we were about to give up. Ultimately, to clear the bone infection, we had to go to another vet clinic to have a major resection done on both rear feet. The canker on the rear feet had cleared up from all the debridement, but the front feet still had canker. We did about 3 weeks of purple mush, which we were hesitant to try, but being financially tapped out after everything we had done left us little choice…so we tried it…it worked. The canker was gone. We moved to TN from MA…we’ve been in TN for 5 months and in that 5 months he has been canker free…until last week. It came back…in all 4 feet and it came back real bad and real quick. I’m wondering if it’s from the wetness and humidity here… Obviously, we know exactly what we’re dealing with, so we started treatment right away. We did one week of purple mush but ran out, so we are doing metro and bedadine right now until we get our order of PM in a few days. We are also going to start him orally on SMZ and Metro tomorrow 2 x day. I will post back in a few weeks to let everyone know how he’s doing. I should also mention we are scrubbing his feet out with bedadine between packing his feet, and we are also going to periodically have our farrier remove as much of the dead canker tissue each week as we can. 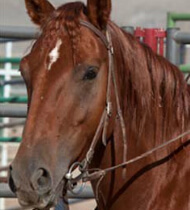 This horse was an amish horse and they threw him out like a piece of trash…we are doing all we can for him that is financially and physically possible. Hoping the purple mush works for us again! the PURPLE MUSH. It isn’t listed on their site because they don’t sell it on the site. But, they make it. And, I think it should be fine making the trip. Just call them! Do one hoof first to make sure it works for you. If it does, you can purchase the rest. through it all, I’m happy to answer any questions. where can I purchase this in the UK? sounds amazing! Hi! My horse has a severe frog thrush condition according to the vet but I think it’s canker. He never got a biopsy of any foot but he has every symptoms of the disease: bad horn continuously growing, bad smell, bleeding when bad horn is removed, started at hind feet and now affecting all members and has no hard horn on any frog. He is suffering!! I tried EVERYTHING on the market: thrush buster, Kevin bacon, Dry Feet(Cavalor), a mix of Canesten & antibiotic cream, Javex soaking, Epsom salt soaking, Iodine, Kopper Care and more, but it keeps growing. Even the coronary band is affected with some weird horn growing all around the foot, and bleeds when removed of course… I live in Montreal, Quebec (Canada) so it wouldn’t be possible for CoCo to come and visit. Is there a email I could use to send pictures of my horse’s hooves? He is one of the weirdest case everyone has ever seen: riders, coaches, vets, farrier etc. I am desperate for trying this Purple Mush treatment, and really like to buy some of it. 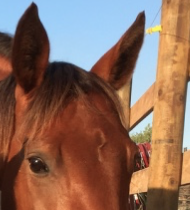 My horse became lame through the years because of this canker horrible disease and I would really like to give him back a decent foot condition. 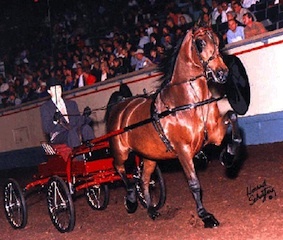 He his such a good horse and never said a word during all painful treatments he received. I think he deserves to be cured after all these painful years of treatments. I’ll wait for any news. I’m so impressed, I sent this along to my vet. We don’t see canker out here in AZ, but you never know… thanks for the info. 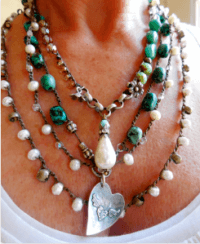 Andrea – the numbers and web sites are near the top of the story. I have to say, I’ve just finished about three weeks with Purple Mush after nearly three months of fighting it with the vet. It’s gone. I’m not one to shout from the rooftops, but this stuff is really wonderful. Easy to use and unbelievably effective. Thanks to the author of this blog which brought it to the attention of one of my students. Someone please tell me where to get the purple mush and how much is it ?my mare is due for 2nd lot of surgery On Friday although she has recovered really well from the surgery on front hoof,we suspect she now has it in both back hind Im going for the surgery again but will follow up witht he purple mush lets hope it works!! I really think that there are a lot more horses suffering from this disease than we know because its so hard to diagnose and owners think its just a case of thrush until its well into its rotting ways. Im going to write a case study so that more people are aware of this horrible thing!!! I am fascinated by this product. I am curious as to why you didn’t post any images of your mare’s feet after the treatment with this product? I have been battleling canker for the past year in my lovely mare Bella and it is getting to that point of making awful decisions. I hope your Purple Mush works!!!!! Is there any indication this treatment would work for White Line disease? I have 3 mares that have had issues with White Line. We think we have them cured but I won’t breathe a sigh of relief until the middle of the summer when I’m sure it won’t come back! Always nice to have treatments on hand. I can say that White Lightening works very well on White Line but depending on the horse it can be difficult to administer. But that is another subject ;o) I’m very happy you had such good results and thank you for sharing your story and the information with us! 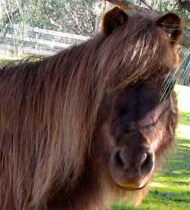 I have a shire gelding who developed canker a out 3 years ago. We have tried all kinds of fixes including phycofixer, diesel fuel, bleach, purple mush, smz tablets,benzyl peroxide, white lightning… The only thing that has shown any improvement is metronidazole given orally. He has canker in all four feet, but after a week of metronidaze one foot has cleared up and the other three are beginning to harden up. We continue to sprat all feet with bleach twice daily. I will continue to check this thread for any other ideas!! Thanks, dawndi. Fortunately we are just entering our “dry” season which will help me out. Well I received a new reformulated batch of PM and applied it last night. This mixture is definitely different from the last, more watery, less purple. The foot treated with MycaSeptic is actually looking the most improved. When I tried to pare its abnormal tissue away it was quite dried up and hard, difficult to cut through, and looked DARK instead of that whitish color. It looked more like normal frog even though I know the frog hasn’t had a chance to grow back and shed off the canker tissue-assuming that is what happens??? Not sure what to make of this. There is a good sized crevice now between canker and normal frog tissues. I am taking advantage of this to get the MycaSeptic product deeper down into there. If anyone tries this MycaSeptic product, BELIEVE the the instructions when it says to avoid contact above horse’s coronary band. This stuff is scary, it dissolves vetwrap and nylon. Smells pleasantly citrus-like but don’t let that fool ya, it is powerful stuff. So sorry about the Davis Boot… I never thought about humidity coming from Northern CA… Yes, a boot that airs is a great idea. I’m glad CoCo is working with you. I had new canker just a month ago and the PM cleared it up instantly, again, for me… But, again, we have very dry earth and dry weather. I’m glad you are documenting this for the humid climate. And, thanks for looking into other cures! Please keep us posted! Thank you! Update to my September 1 post: I have been diligently medicating my horse but don’t think his canker is cured yet. His foot soreness has reduced a lot, and i am able to cut away more and more canker tissue without hitting blood, and it doesn’t seem like it is growing out of control anymore… so that’s something. More recently it seems like when I take the dressing off the frog is moist and stinky again so I was afraid I wasn’t making progress anymore. I talked to Coco today and he’s going to increase whatever ingredient in the PM that is a drying agent and send me another batch. I live in Florida and it is still humid and frequently raining here plus the ground is very dewy at night. I never turned him out in rain though. I had to use a different boot after the first disastrous 5 days using a Davis boot – I poured no less than 1/4 cup of stinky bacteria-laden sweat out of the boot when I took it off! Plus the vetrap was soaked. This mosture scalded the skin on his pasterns terribly also but that cleared up with some TLC. So don’t use a Davis boot in hot humid weather. I switched to a nylon fabric “Hoof Bandage” which is breathable and working well. I may ultimately end up going with a low hard boot. We still have 2 more feet and tonight I did my first treatment of them, trying 2 other “sure fire cures” on those to see if they work any better than the PM. I heard about these (scarlet oil and Mycaseptic) from people who swore they cured canker. 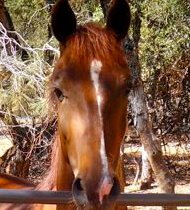 Scarlet oil was first-person story and her vet recommended it; the Mycaseptic was 2nd person (a farrier that knows another farrier that cured canker with it). Will post updates later on. Thanks to everyone who has posted their stories and helpful info about this dread disease. I used this on my 29 year old Appendix mare. She had a superficially mild case of canker, but I was worried because her hindquarters were already compromised due to an old track injury, and I felt her sore front hoof would just put her over the edge. I used the purple mush for just 10 days before her frog went from soft and spongy to hard again, and the small canker that was growing in between her frog and heel bulb was completely gone. I am absolutely elated that I didn’t have to subject her to surgery or wrap her foot daily for months at a time. I just received my purple mush shipment yesterday. I communicated with their “East” salesman Tim, who was very helpful. Am going to treat his worst foot first – he has it in all 3 dark feet – the one white foot is normal. Will repost with results. I am really hoping this works because that deep surgery is scary looking. My vet, after diagnosis, said he’d call me the next day with treatment recommendation – yet 2.5 weeks later, no word from hiim so I guess I’m on my own. Fortunately my horse’s feet look nowhere near as bad as the photos I’ve viewed online so I am hoping a couple of treatments cure him up. His right hind foot is the worst one and has been sore to stand on. I just called to leave a message for Coco. I sure hope I can get this stuff soon. I have a 28 year old Appendix mare that already has compromised back legs due to an old track injury, and this front left being sore from canker is really putting her under stress. We’ve tried soaking in Trifectant daily for 5 weeks now, with no results. We use a natural trimmer, and he said that she requires surgery to remove the entire area of the frog that is affected. Of course, then the soaking and wrapping, etc. This is not my horse, but a boarder’s. Her owner cannot afford the surgery, and I refuse to have her euthanized until I’ve done everything possible to help her. This would be a miracle for us. I cannot find the Purple Mush listed anywhere on the well horse site. Could you please tell me how to order this product specifically? Thank you. Just reading this has my heart racing !! 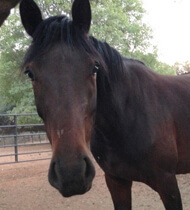 My 8yr.old TB mare has been suffering with Canker for 2yrs. now….The RF foot is the worst.She has it all 4 now.It spread despite all of my efforts to heal it.In the last month the RF has started to become deformed from horn overgrowth….I truly hope this is our miracle…Waiting to hear back from Coco.Will let you know how it goes…..I’ve tried everything !! I hope this is the end of this nightmare…Finally ! Thank you! I have sent a Thank you to her directly. Per your request above of 5-3-10, this link has been posted on (x) Face Book wall page. Thanks for the information. I contacted Coco after reading this and it is amazing how this worked. 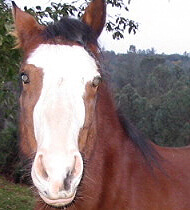 Our Clydesdale had Canker in all four hooves when we got him. After months we had it cleared in three of the hooves but the fourth hoof we could not clear up. We have done two 5 day cycles with Purple Mush and it is almost all cleared up and looking amazing. Thanks again for posting this article and putting us in contact with Coco and well-horse.com. I would be happy to discuss this with anyone. Please don’t hesitate to contact me at jkerber@castlewoodstables.com if you have any questions or can’t believe it. I am so relieved at the success we have had with this. Sophie, go to Well-Horse.com and look for lincolnshire UK , you can then order from me and I will get some sent over. My friend and I are now selling it. This is a update to my post above. I am so happy I found this Website and tried this product. I was skeptical but it IS working. My mare has canker in all four feet and has had it since this time last year. Her frogs and heel bulbs look like bloody fish roe and she was lame on the left front from Jan to March. Her feet are awful looking on the outside wall as well. I’m on my second application of this Purple Mush right now and the improvement is better than ALL the remedies I’ve tried for the last year. Dawn’s post here literally saved my mares life. Contact CoCo you will be glad you did. I will post here with my future improvements. I have ha mare with canker and I will do everything to make hir free from it. How do I finde this Purple Mush? You should try it. The purple mush is a lot less expensive than all the other remedies. And, it works fast. If the canker is real bad, get a hospital plate and pack it in. If not, just pack it and wrap it. Up to you whether you believe or not. If you tried, you’d know. I’ve battled Canker in my Mare for a year now – ALL 4 feet. I thought I had it beat, was sure it was gone in the back feet But no, it’s back worse than ever. I’ve read and tried almost everything in the last year, this sounds too good to be true. I sure wish I could try some though, it’s hard to believe this story I’m sorry.. If it’s true I am very happy for you and your mare.